(?) being out to concert, Lena has friends in. Thursday November 6 Another pleasant day, tho' more breezey than yesterday, but Mer stood 39°+ at 7 o,c, & rose to 60°+ in P.M. standing 52°+ at sunset. Lena (?) the time to wash and her window up stairs, & finish cleaning in kitchen, her sister Mary here to dinner with her & Lena off down town with her in P.M. I spent couple hours with Rose. Ellery up so as to put up pipe to s-room stove before supper, so I could spend eve there. 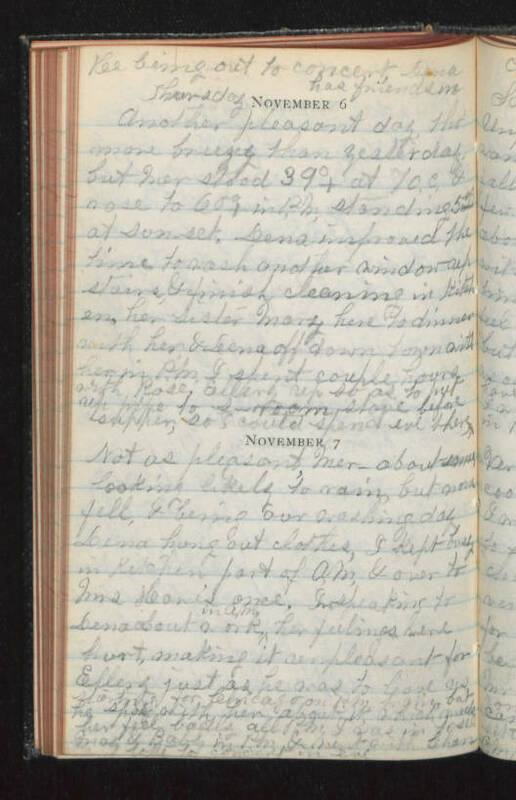 November 7 Not as pleasant, Mer- about same looking likely to rain, but none fell, & being our washing day, Lena hung out clothes, I kept only in kitchen part of A.M. & over to Mrs Howe's once. I speaking to Lena about work in A.M. her feelings were hurt, making it unpleasant for Ellery just as he was to leave us starting for Chicago on P.M. train, but he spoke with her "about it" which made her feel badly all P.M. I was in to see Maz & Baby in P.M. & went with Charlotte to concert in eve.